A Sweet and cute Giveaway sponsored by Himalaya Herbals, here is a chance to Win Himalaya Herbals Aloe & Cucumber Refreshing Moisturizer Lotion for a refreshing and cool feel in this summer. 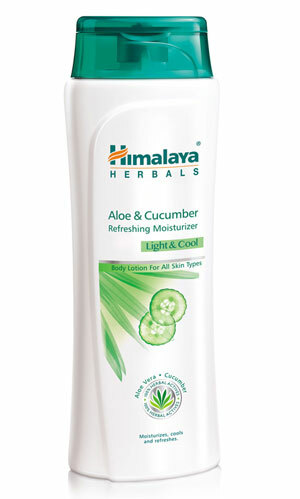 Himalaya’s Aloe & Cucumber Refreshing Moisturizer, is a light and cool body lotion that hydrates and refreshes your skin without leaving it sticky. The fast absorbing, daily-use body lotion is enriched with Aloe Vera and Cucumber, which leave your skin smooth and refreshed. · Aloe Vera, known for its many healing properties. It can be used topically or consumed in its juice form. It is rich in enzymes, polysaccharides and nutrients that exhibit antibacterial and antifungal action. A natural UV inhibitor, Aloe Vera’s hydrating, softening and intense moisturizing properties nourish the skin. · Cucumber cools, invigorates, refreshes and helps maintain skin’s moisture. It keeps skin soft, has healing and soothing effects on damaged skin. It is also a natural sunscreen. The abundance of antioxidants and silica in Cucumber rejuvenate the skin and leave it feeling soft and smooth. Apply lotion gently all over the body, slowly massaging it in. Best used after bathing when your skin is most receptive of hydration. There will be FOUR Winners, each one will get a Himalaya Herbals Aloe & Cucumber Refreshing Moisturizer Lotion. Share about the Giveaway in the facebook by tagging five of your friends. Visit www.himalayahealthcare.com and tell your favourite product with your email id, and FB share link in the comment section. The Giveaway starts from today and ends in 3/5/2013 Friday. nice giveaway :) i love himalaya stuff:D my fav is their neem face wash and protein shampoo fr dry hair! I like the apricot scrub from Himalaya. Hi, thanks for the lovely Giveaway. Followed all steps. My favourite Himalaya product is "Refreshing Cucumber Soap". Am using it daily and have found positive result. It is very mild on skin. Thank you for the Giveaway Radha! Subscribed to all. lipbalm, himalaya neam face pack, apricot scrub .